Besides the timing involved with proofing this dough for about 45 minutes, this is really simple for a yeasted baked good! You literally mix the yeast and other dry ingredients together in a bowl, then add a warmed mixture of water and butter. Stir and just spread the dough into a loaf pan. That's it. The recipe states it's okay if you can't spread the dough all the way to the corners of the pan because it will spread as it rises. I didn't have a problem with this. The photo above shows the dough that's just been mixed and spread into the pan. I made both the dough and streusel topping ahead and covered both with plastic wrap and stored them in the fridge overnight for baking the next morning. It's hard to tell but the dough in the photo above has risen to about double the original size. The streusel is made with chilled/room temperature butter cut into the sugar and cinnamon mixture. I'm still undecided about the best way to make streusel though I'm a little more inclined to think the melted butter method might be a bit easier in terms of getting larger clumps, which I like. As I mentioned, I wanted to incorporate chocolate into the picture. It's totally optional but if you love chocolate as much as I do, I don't think you'll regret it. I sprinkled about 2 tablespoons of mini chocolate chips among the topping that goes on top of the dough. In 30 minutes, you will have a fragrant, golden-brown yeasted coffee cake to admire and treat yourself and your family to. This cake, baked in a standard loaf pan, slices into 3 solid portions but it's certainly up to you if you want to eat a little more, or less. To take it over the top, make a simple glaze and drizzle some over the warm cake right before serving. It may not be necessary but it sure is nice! And for the adults, make sure there's some strong hot coffee ready to go. What a great combination! Like a cross between coffee cake and cinnamon roll, this cake was really tasty and we cleaned our plates. The cake texture is light and bouncy, with a bit of chew to it. The streusel topping adds sweetness, crunch, spice, and even chocolate, in my case! I was a very happy camper after enjoying this treat. Update (January 2018): After making this delicious cake again, I realized I really like the streusel topping from the small batch coffee cake here. It's a bit less rich and sweet, and is easy to put together. I've adjusted the recipe below accordingly. In a medium bowl, stir the flour, yeast, sugar, and salt together. Place water and butter together in a measuring cup and heat in the microwave until mixture reaches 130 degrees (use a thermometer to check; because the yeast has already been added to the flour mixture, the appropriate temperature is hotter than normal). Stir the egg yolk and vanilla into the water-butter mixture and pour immediately into the flour mixture in the bowl (don't let the liquid mixture sit because it can cook the egg yolk). Make streusel by combining all the ingredients except for the chocolate chips in a small bowl. Using your fingers, pinch ingredients together to make some larger clumps. If using, lightly stir in the mini chocolate chips. Spread the streusel topping evenly over the dough. Bake for 30 minutes, until crumb topping is browned and a cake tester comes out clean. Remove from the oven and while cake cools slightly, make the glaze by whisking ingredients together. Slice and plate cake. Drizzle with icing, then serve immediately while still warm. *Do Ahead option: To prep the cake in advance, prepare the dough as described (without proofing) the night before. Cover the pan with plastic wrap and refrigerate. In the morning, remove the dough from the refrigerator and let rise in a warm spot until doubled in size (this may take about an hour). Continue with recipe as listed. Streusel topping can also be made ahead of time. Cover with plastic wrap and store in the fridge until ready to use. I've been wanting to try a yeasted coffee cake for a while and after seeing yours I totally need to soon. It looks amazing and I love that this recipe makes a small batch! Anything with a streusel topping gets my vote! I never thought about/realized that some coffee cakes were made with yeasted dough. Felt like maybe I've been living under a rock. Anyway, such a treat! Yeast cakes are very popular over here. 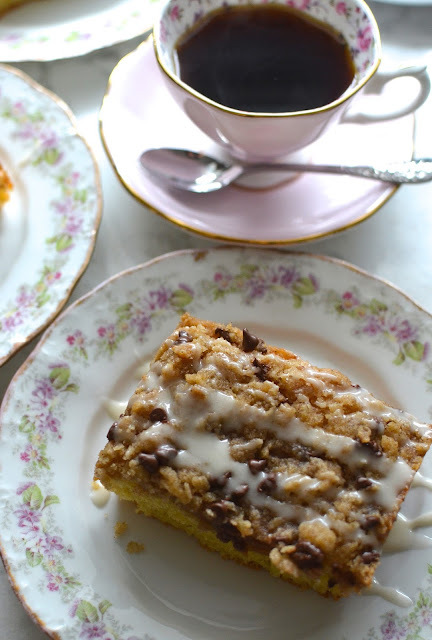 Your coffee cake looks amazingly delicious! Yes...amazing how much you can gobble up so it's a safer bet to make a smaller portion. Wow, this looks great! I haven't had a yeasted cake…May be yes, Panettone is a kind of cake, right? I am glad you shared this recipe for two. It looks so tempting, would be great for breakfast! Oh Monica, the look of this yeasted coffee cake is just perfect with a cup of coffee or tea...I can imagine the lovely smell when this is coming out of the oven...thanks for sharing the recipe! It did smell wonderful. Thank you, Juliana. This weekend I had a slice of soft and probably the best cinnamon coffee cake and since then, I have been dreaming to try to make it at home! I am loving this yeasted version Monica and can't wait to make it at home soon! I love it when I eat something so good that I go to bed thinking about it...or just thinking about it a lot in general. : ) I had sweet thoughts about this all day after tasting it. It's great! What mom would not love this for breakfast in bed with a cup of coffee/tea! Going to have to send some messages to the boys to give them a hint. Hope you are doing well. haha - glad you like it! It was dangerously tasty! This looks completely delicious. 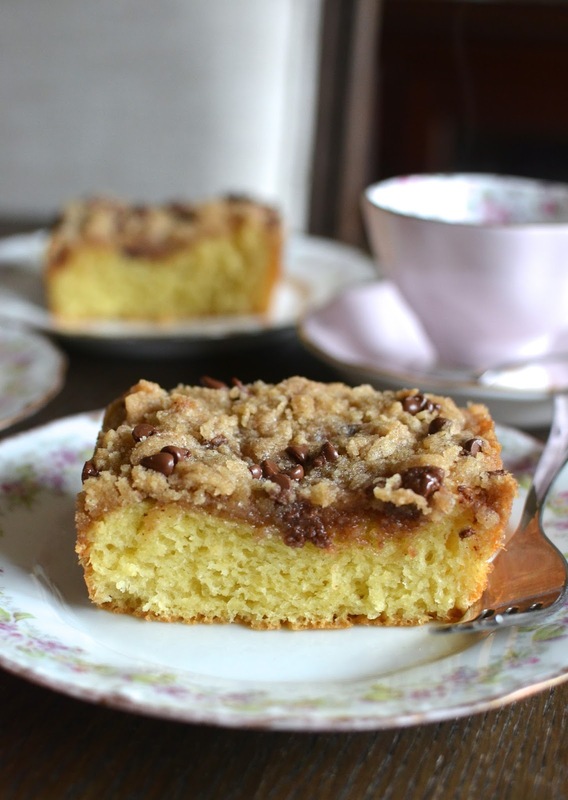 Coffee Cake is the best - love the idea of just giving it a hint of chocolate! Oh I love this! An yeasted coffee cake...Gosh how amazing with a streusel and glaze. You have taken yeasted desserts to a completely new level. I never even knew about yeasted coffee cakes so I get no credit except for finally opening my eyes! haha. It was a great experience making and tasting this sweet cake. This sounds like a great recipe. I know this is a dumb question but I'm in Malaysia where we go with Celsius so I just wanted to check that you mean 130 degrees F? Also, I don't have a thermometer and should probably invest in one but approx. how long does it take to heat the water/butter in the microwave to get to the appropriate temperature? Usually, we warm liquid to roughly 110 degrees when working with yeast; at that range, the liquid feels warm to the touch. With this recipe, I'm told you take the temp up to 130 degrees because the yeast has been mixed with the flour already so you need a higher temperature. At 130 degree F, the water feels hot. I would really recommend getting a thermometer because it's hard to say how long to heat it for since it depends on the temp of the water you're starting out with, etc. But if you must estimate it, heat the liquid so that it's a bit beyond warm and starting to feel hot. Too hot and you can kill the yeast and it won't work...good luck! They really are easy to love. This looks great. I don't think I've tried making a yeasted cake before, I really should. Thanks for the inspiration! This is almost as easy as a regular cake. Hope you give it a try. I've never made yeasted coffee cake either, but yours looks so good! I've made a few recipes from that cookbook and think it's a great idea - I have a sweet tooth, but there are only two of us at home now, so we don't need lots of leftovers.